STRYPER are back to reclaim their throne in the hard rock/heavy metal world with the latest song from their upcoming 9th studio album, Fallen. The title track “Fallen” can be heard below. The original lineup comprised of Michael Sweet (vocals/guitars), Oz Fox (guitars), Tim Gaines (bass) and Robert Sweet (drums) return with an album of all new material showcasing the musicianship that garnered them a huge fan base in the mainstream world and the Christian market. From the opening choral refrains of “Yahweh” to the signature vocal scream at the end of “King Of Kings”, it is apparent that STRYPER is back with their heaviest and most inspired work to date that is scheduled for release on October 16th via Frontiers Music SRL. 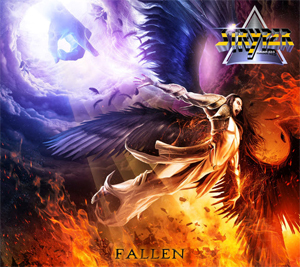 Fallen is available for pre-order via digital retailers and can be ordered via iTunes at http://radi.al/StryperFalleniTunes and via AmazonMP3 at http://radi.al/StryperFallenAmazon. It is also available in various physical configurations at www.stryper.com/fallen. Fallen was produced by Michael Sweet. The latest song comes on the heels of the album teaser track, “Yahweh”, that was released last month and has been listened to over 135K times since it went live. “Yahweh” was a musical writing collaboration between Michael Sweet and SEVENDUST’s Clint Lowery. Tracks like “Pride”, “Big Screen Lies” and “Til I Get What I Need” show that STRYPER is back and better than ever. STRYPER offer their unique interpretation of the BLACK SABABTH classic “After Forever”. The band flexes their softer side on the instantly memorable “All Over Again” which continues the journey STRYPER fans began almost 30 years ago when “Honestly” was released to mainstream success. "Till I Get What I Need"
"King Of Kings" STRYPER is one of the top Christian rock bands of all time. Comprised of the original line-up, STRYPER has been rocking since 1984, and is responsible for such '80s metal classic albums as Soldiers Under Command, To Hell With The Devil and In God We Trust. In fact, STRYPER is the first band to ever have two songs in MTV’s Top 10 simultaneously with their hits “Free” and “Honestly” After a sabbatical for much of the 1990's, STRYPER returned strong in the early 21st century. To date, the Dove Award-winning and Grammy nominated band has sold upwards of 10 million records worldwide. Their last studio album No More Hell To Pay debuted in the Top 40 of the Billboard Top 200 landing at #35.